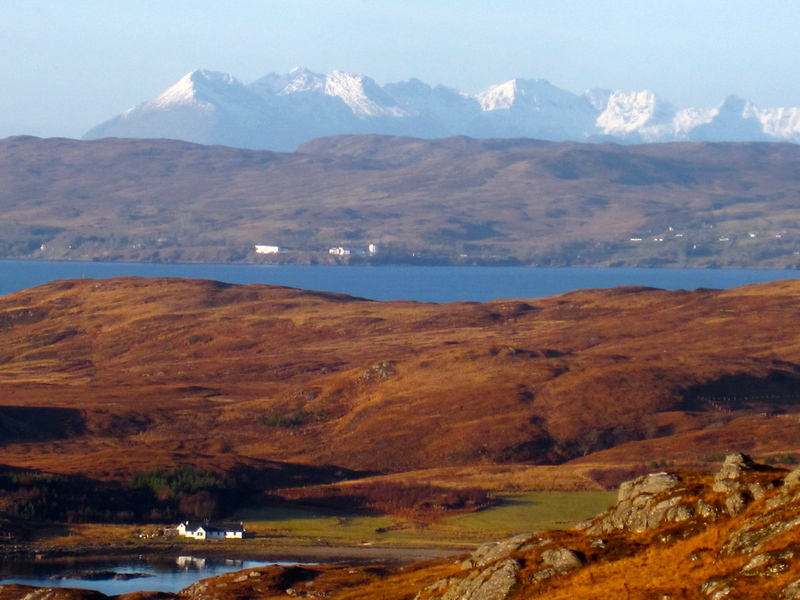 Afternoon view from Knoydart across Sandaig and Morar to the distant Cuillan Ridgeline on the Isle of Skye. Who’d have thought you’d come to Scotland in winter to walk in your t-shirt and get sunburnt? True! It was 1C yesterday but it was blue, blue, blue and not a breath of air. Mind you, sunrise wasn’t until 9am and I skated along the icy path from Inverie up over the hill towards Airor then bashed across the moors and hillochs further west past Glaschoille Loch for a view across to the impressive Cuillin skyline on the Isle of Skye in the distance. It’s really quite hard to get a sense of scale of the mountains in Scotland – they are so large, but when you are out in the wild, there is nothing to compare them to to give you a sense of scale. What looks like a half hour walk turns out to be 2 hours, and the going is harder as, for the most part, there are no paths: you pick your way amongst the bogs and burns and tussock grass. View east across to Inverie from above Glaschoille. 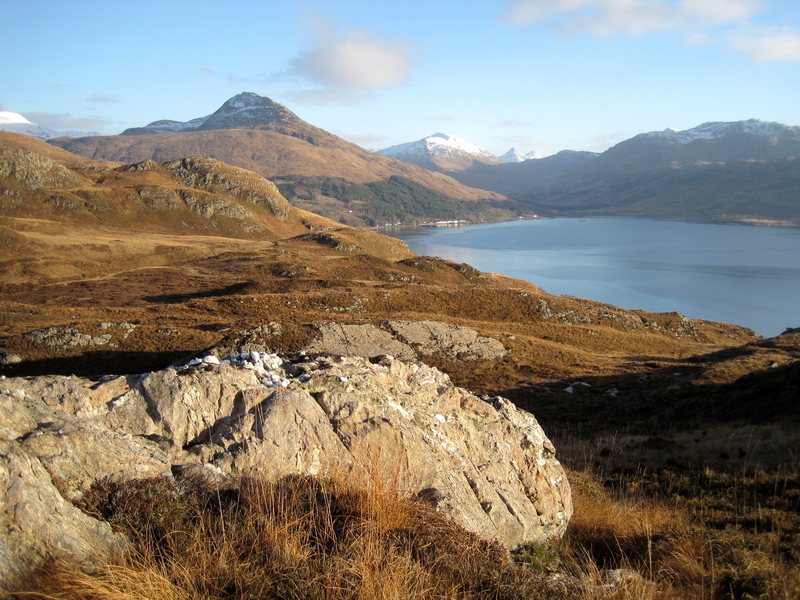 Sgurr Corrie Choinichean is the big mountain above the white washed buildings of Inverie. The snow-capped munro, Laddher Bhein (“lar-ven”) is to its left. 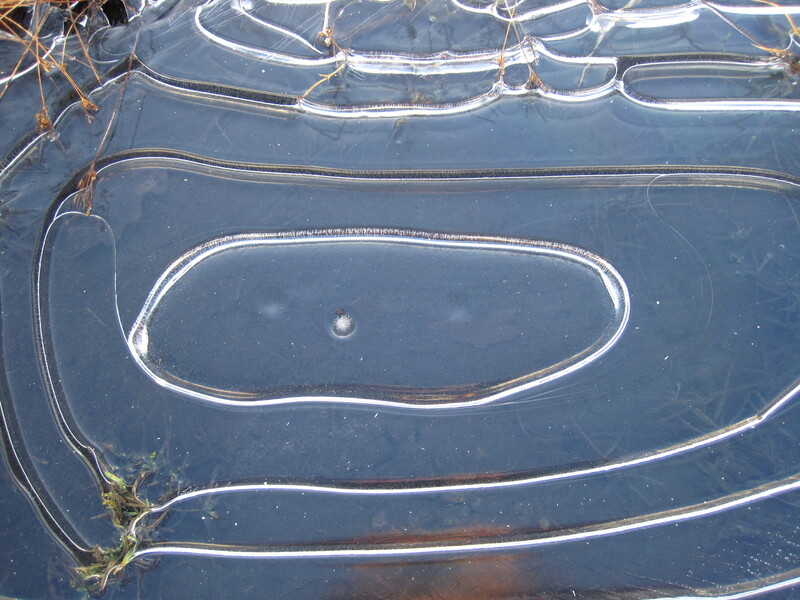 I did discover there are distinct advantages to it being so cold that all the water has iced over: when yomping across a bog (there are lots of peat bogs around here), as long as you are relatively fleet of foot, the crunchy ice layer gives you just enough support to race across instead of sinking in the mire to your knees, as is my usual habit!